Two newspapers printed by the Poalei Zion organization in Lodz on May 15, 1948, the day after the State of Israel's Declaration of Independence. Yiddish and Polish. 1. Wyzwolenie [Liberation], newspaper published by the Central Council of Poalei Zion in Poland. Lodz, May 15, 1948. Issue no. 1. Polish. 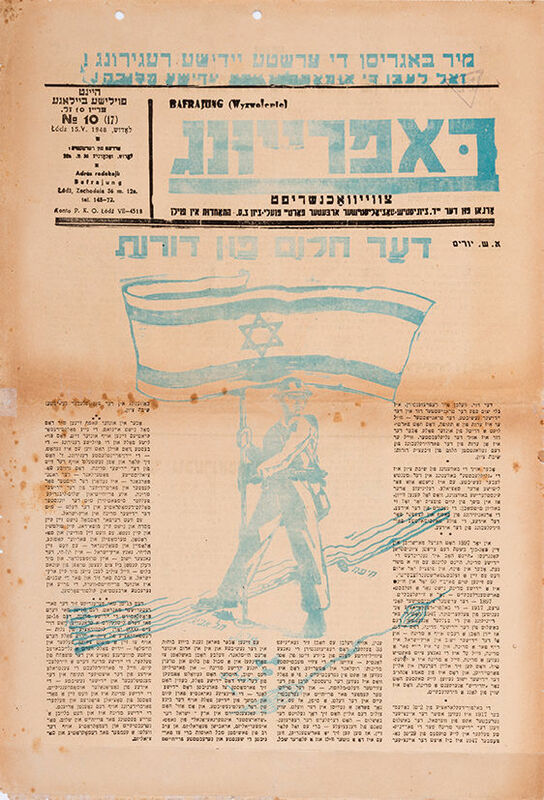 Printed at the top of the first page is the title: "Long live the Jewish State – The State of Israel!". The issue includes: photographs of Mapai members who participated in the People's Council – David Ben Gurion, Moshe Sharet, Eliezer Kaplan and David Remez; photographs of Haganah soldiers; an excerpt from a speech delivered by David Ben Gurion; and more. 4 pp, 47 cm. Fair condition. Folding marks. Tears to margins, along folding marks and to seam between the leaves. Stains. Torn and detached strip at the bottom of both leaves as a result of folding (without damage to text). Thin and brittle paper. 2. Befreiung [Liberation], newspaper published by the "Organ fun der Yid. Zionistisch-Socialisticher Arbater Partie Poalei Zion Hitachdut in Polin" [Poalei Zion in Poland]. Lodz, May 15, 1948. Issue no. 10. Yiddish. Opening the issue is a blessing for the establishment of the state, "We Bless the first Jewish Government". On the first page is an illustration of a soldier waving a flag; beneath him is a map of Palestine. The illustration accompanies an essay by A. S. Yuris (Avraham Shmuel Yuris) – "Der Chalom fun Dorot". 4 pp, 47 cm. Fair-good condition. Folding marks. Tears and open tears to margins, along folding marks and to seam between the leaves, some of them restored. Stains. Filing holes at the top. Pages partly detached. Thin and brittle paper.